Located on Maryland's Eastern Shore, the Inn at Perry Cabin is a romantic weekend retreat where you can spend your days relaxing by the pool, looking out across Chesapeake Bay and enjoying delicious meals at Sherwood's Landing. The stunning inn dates back to the colonial era and was the site of the main wedding reception in the hit film "The Wedding Crashers". 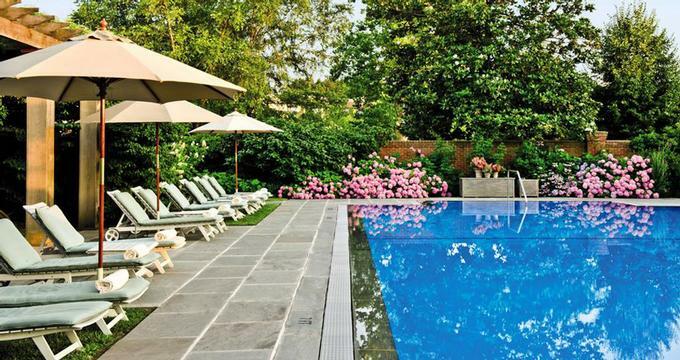 The 25-acre estate offers a heated outdoor swimming pool and a fitness center. There is also plenty to do nearby, from golf and fishing to historic tours and horse-drawn carriage rides. A great way to explore the area is by bicycle - borrow a complimentary bike, made for one or two people. Points of interest include Chesapeake Bay Maritime Museum, the Ward Museum of Wildfowl Art and Blackwater National Wildlife Refuge. From luxurious facilities such as the infinity-edge pool and steam room to relaxing yoga classes and healing treatments, the spa is the place to relax and rejuvenate on vacation. The spa is named after the linden trees that grow on the property. Look for spa packages when booking your trip. There are 81 individually furnished guest rooms featuring English and early American antiques and classic Laura Ashley fabrics. Enjoy understated 19th-century elegance at this beautiful hotel and plush amenities such as spacious bathrooms, plush robes, freshly-baked cookies during nightly turn-down, and Wireless internet. Superior Rooms: Located in the historic colonial section of the hote, the rooms feature dark-wood furnishings, shutters to your private patio with a view (some rooms do not have the patio, so be sure to ask when booking your stay). Deluxe Rooms: Offering views of manicured waterfront lawns, these rooms are decorated in nautical blues and greens. Deluxe Waterview Rooms: If you want a view of the water, this is the room to get. Studio: These charming rooms have a view of the water. One-Bedroom Bi-Level Suites: If you need more space on your weekend getaway, book one of these spacious suites with a large downstairs living area, picturesque river views and plush bathrooms. Master Suites: These luxurious suites offer stunning views of Miles river and include additional luxuries such as a second TV. Stars: A gourmet seafood restaurant frequented by locals and visitors alike, Stars offers an eclectic menu featuring fresh seasonal specialities. Afternoon Tea is served daily, complete with delicious breads, English scones and preserves. The Purser’s Pub: Relax next to the open-hearth fire at this old-world pub which serves cocktails and light fare in the garden courtyard. Enjoy a romantic wedding on the lawn by the water’s edge like those featured in movies such as The First Kiss and The Wedding Crashers. The property offers a engagement, wedding and honeymoon packages for the romantic couple. The "Engagement Package" starts at US$1,300 and includes: a night in a Master Suite, Three-course gourmet dinner and breakfast the morning after. Guests also receive champagne, chocolate covered strawberries, roses, and a romantic rose-petal turndown service. The property is just 90 minutes from Washington DC and Baltimore, two hours from Wilmington and 2.5 hours from Philadelphia. Easton Municipal Airport is ten minutes away. The property is accessible by helicopter as well. Doubles start at $195 per night; suites from $415. The inn offers a selection of packages and specials. The "Gourmet Package" includes: breakfast (US$45 per room, per day) and Dinner for two at Stars (US$150 per room, per stay). The "Suite Escape" deal includes 20% off a suite during certain times of the year. For couples expecting a baby, "Babymoon by the Bay" is a great package that will help you get relaxed in a beautiful setting. The offer includes: signature smoothie, breakfast, One 50-minute soothing massage for him, pre-natal massage, pedicure and manicure for her, and a romantic dinner for two. Spa fans can look at the "Linden Spa Experience" which includes: a US$125 spa credit per stay, and breakfast in the morning. The "Celebration Package" is great for couples celebrating their anniversary of another special occasion. The special includes: a la carte breakfast for two, wine, gift and a romantic dinner (US$150 per room, per stay).